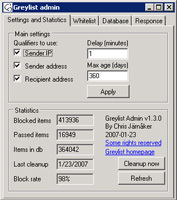 Grey list is a freeware add-on for Exchange that implements grey listing. It installs as .dll onto the existing SMTP service and runs against a local MS Access database or a (preferred) MS SQL 2000/2005 server. When using it with MS SQL then it supports database sharing across several Exchange servers that face the internet to ensure that the grey list is shared between the servers. It has been developed with the common Exchange administrator in mind and is available as freeware together with the source code. This site does not contain serial number, crack, keygen Greylist serial number : serial number is the simplest type of crack. A serial number(cdkey,product key,etc) is register the program as you may already know. 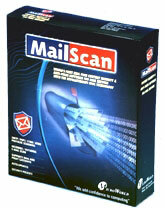 a crack or keygen may contain harmful software. If you cannot find the exact version you want, just give it a try. for more information read .nfo/.txt/.diz file include in zipped file.